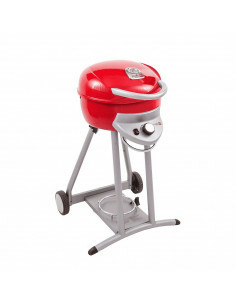 Barbecue Il y a 94 produits. 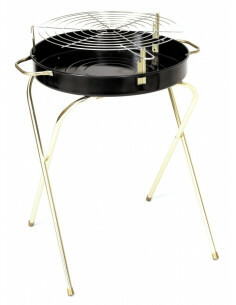 Features Grill zone non-stick single fish basket Convenient single fish basket. 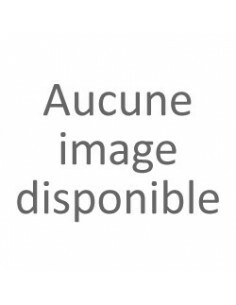 Dimension - 0.79 x 5.75 x 26.77 in. Item Weight - 1.1 lbs. 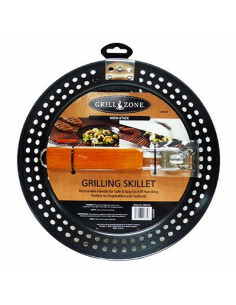 Features Grill zone non-stick round skillet with removable handle Designed to help with many grilling needs non-stick finish perfect for vegetables & seafood! Removable hardwood stay cool handle for easy on/off handling. Dimension - 1.57 x 12.01 x 12.01 in. Item Weight - 1.43 lbs. 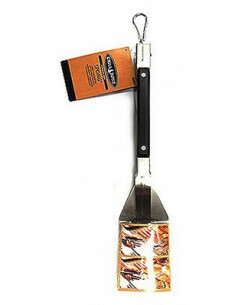 Features Grill zone silicone basting bottle with cap Fill with your favorite sauce then just squeeze bottle, indoors or outdoors Perfect For Ribs, Roasts, Steaks, Poultry, Fish & Vegetables, Cover Bottle With Cap To Store Leftover Sauce silicone bristles are heat resistant. Dimension - 2.28 x 5.43 x 12.4 in. Item Weight - 0.33 lbs. 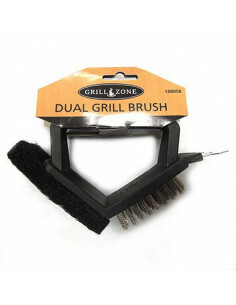 Features Grill zone dual grill brush & pad Stainless steel bristles & abrasive pad scrubber For gas grills Charcoal grills & hibachis Always test in small area of cooking grid first. Dimension - 2.76 x 5.71 x 6.89 in. Item Weight - 0.33 lbs. 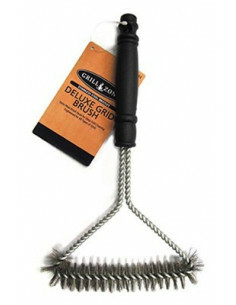 Features Grill zone stained wood BBQ brush Stainless steel bristles for gas grills Charcoal grills & hibachis Always test in small area of cooking grid first Color - Brown Size - 18 in. Dimension - 1.85 x 2.36 x 18.31 in. Item Weight - 0.63 lbs. 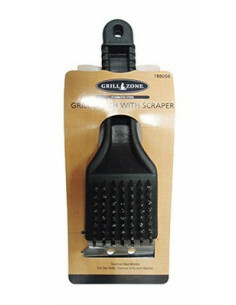 Features Grill zone Stainless steel bristles Steel scraper Plastic grill brush Size - 8 in. Dimension - 1.97 x 3.54 x 8.27 in. Item Weight - 0.28 lbs. 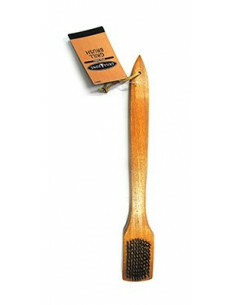 Features BBQ grill brush with molded in scraper Crimped brass bristles 5/8 in. Trim in black plastic block. Size - 10.5 in. Dimension - 10.5 x 3 x 1.5 in. Item Weight - 0.3 lbs. 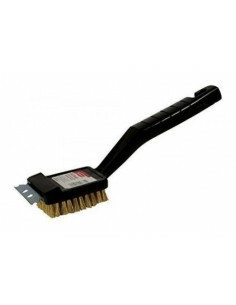 Features Grill zone Short handle triangle grill brush Perfect for cleaning your grill and making it spotless Features a convenient short handle Size - 12 in. Dimension - 1.38 x 6.3 x 12.4 in. Item Weight - 0.48 lbs. 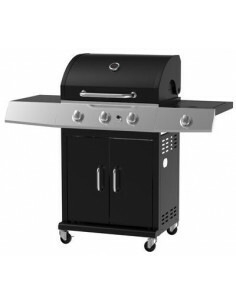 Features Grill zone locking tongs with bakelite handles Locking tongs with Bakelite handles Perfect for grilling your favorite foods Easy to use Convenient and easy to clean Dimension - 1.97 x 1.18 x 18.5 in. Item Weight - 0.81 lbs. 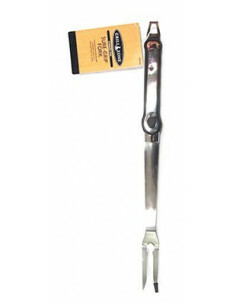 Features Grill zone Platinum rubberized stainless steel spatula Stainless steel fork Ideal for all your grilling needs Dimension - 18.38 x 1.5 x 1.25 in. Item Weight - 0.62 lbs. 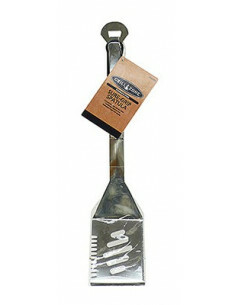 Features Grill zone platinum rubberized stainless steel spatula Platinum rubberized stainless steel spatula Convenient and easy to clean This stainless steel spatula is ideal for all of your flipping and grilling needs Dishwasher safe Dimension - 18.13 x 3.78 x 1.3 in. Item Weight - 0.81 lbs. 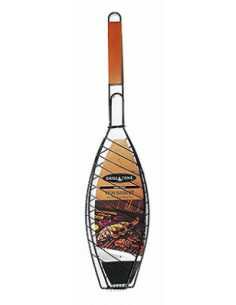 Features Grill zone locked sponges with bakelite handles Unique & easy to use Spatula & tong combination Ergonomically designed heat resistant handles for simple handling Mirror polished finish for a sleek & modern look. Dimension - 2.36 x 4.05 x 18.9 in. Item Weight - 1.21 lbs. 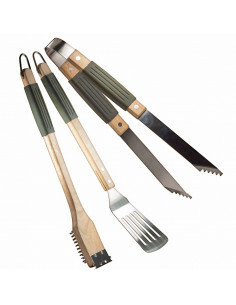 Grill zone, 3 piece, wooden handle barbeque tool set, with natural color wooden handle & rubber sleeve, stainless steel 1.5 mm thickness, includes spatula, tongs, & grill brush. 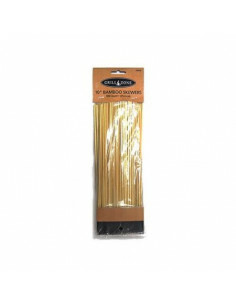 Features Grill zone bamboo skewers Ideal for kabobs, meats & marshmallows 100 pack Size - 10 in. Dimension - 0.32 x 4.02 x 12.79 in. Item Weight - 0.31 lbs. 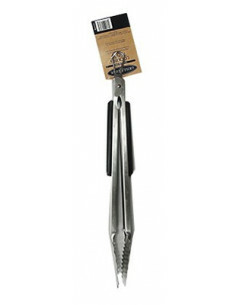 Grill zone chrome BBQ skewers Heavy duty chrome plated steel easy to clean ideal for kabobs Meats & marshmallows 4 pack Size - 15 in. Dimension - 0.12 x 4.33 x 18.66 in. Item Weight - 0.28 lbs. 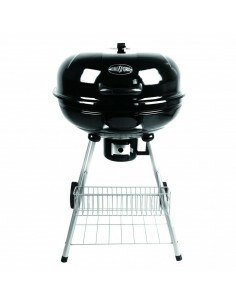 Features Grill zone 1.2 mm. 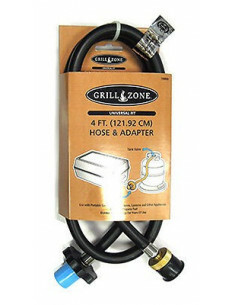 hose & adapter Allows the use of refillable propane cylinder for tabletop gas grills that uses 1 lb disposable tanks Size - 4 ft. Dimension - 1.97 x 5.12 x 11.81 in. Item Weight - 0.88 lbs. 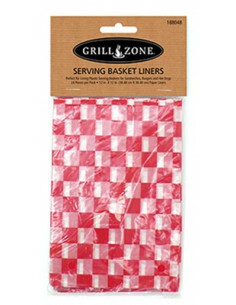 Features Grill zone paper liners for barbecue serving baskets Perfect for lining plastic serving baskets for sandwiches Burgers & hot dogs 24 pack Size - 12 x 12 in. Dimension - 0.39 x 4.29 x 8.66 in. Item Weight - 0.15 lbs. 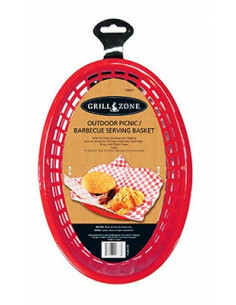 Features Grill zone barbecue serving basket Perfect for picnics Barbecues & tailgating serve up sandwiches, hot dogs, french fries, onion rings, burgers & chicken fingers. 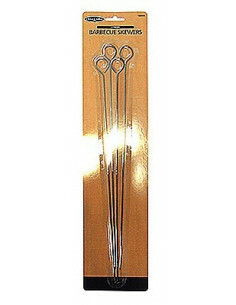 4 pack Size - 10.5 x 7 x 1.75 in. Dimension - 2.68 x 7.87 x 12.6 in. Item Weight - 0.6 lbs.